Janet Carson, Arkansas extension horticulture specialist, will be the guest speaker for the Stephen F. Austin State University SFA Gardens' monthly Theresa and Les Reeves Lecture Series, slated for 7 p.m. July 12 in the Brundrett Conservation Education Building at the Pineywoods Native Plant Center. NACOGDOCHES, Texas - Stephen F. Austin State University's SFA Gardens will host the monthly Theresa and Les Reeves Lecture Series at 7 p.m. July 12 in the Brundrett Conservation Education Building at the Pineywoods Native Plant Center, located at 2900 Raguet St.
Janet Carson, horticulture specialist for the University of Arkansas's Division of Agriculture System Cooperative Extension Service will present "Blinding Color in the Garden." 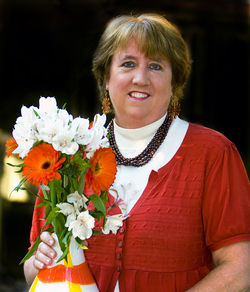 Carson has been the extension consumer horticulture specialist and statewide master gardener coordinator with the university's extension service since 1992. She travels all 75 counties doing horticulture programming and writes a popular gardening column in the Arkansas Democrat-Gazette each week with monthly feature stories in Arkansas Living Magazine and Arkansas Gardener Magazine. Carson was the extension's 2017 Employee of the Year and has won numerous awards during her career. She has written two books, "In the Garden" and "Field of Feast." She is married with two grown children and three dogs.